Upper-class women wore tight corsets, bustles, and wide hoop skirts to fancy balls. The layers weighed almost 30 pounds (14 kilograms)! For everyday, whether at home or nursing soldiers, women put on multiple layers of simple fabrics. Some daredevils sported women's trousers—called Bloomers—to make a statement on women's rights. Civil War soldiers wore flannel and wool uniforms—blue in the North and gray in the South. Men of fashion donned suits with velvet collars and silk lapels during the day and coats with fancy tails for parties. Underneath their everyday clothing—a shirt, tie, vest, coat, and trousers—men wore "drawers," baggy long undergarments that buttoned in front and tied in back. Slaves wore whatever their owners gave them—usually only two sets of rough linen clothing, one for winter and one for summer. Girls had loose garments called pantalets and pinafores, while sailor suits were popular for boys. Read more about wartime fashions of the 1860s—from ankle boots to parasols and tiaras—in this fascinating book. Hoopskirts, Union Blues, and Confederate Grays illustrates and explains Civil War fashion in the most visually appealing way possible. With real Civil War time photos, you’ll feel like you’re discovering a whole new world! 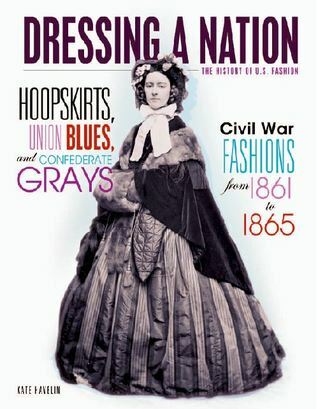 Hoopskirts, Union Blues, and Confederate Grays is a very interesting book for the history geek inside all of us. It’s really very fascinating to see what people around 150 years ago were wearing! It was truly exciting. I absolutely adored the formatting on this one. It was modern and lovely, but didn’t take away from the history sense of book at all. Colorful and engaging, it made you want to read more! I really admired the pictures that were showed in this book. They were authentically old, yet charming, in a very lovely kind of way. It takes you back in time. Overall, this book is a must-read for the history geek, the fashionista, and the picture geek in all of us.